Lexi Thielen, who is currently in remission with leukemia, was granted a wish for a trip to Disney World in April by the Make-a-Wish Foundation. The trip allowed her family to spend some extra time together and make up for some of the time they have spent apart when taking turns during her long hospital stays. When Paul Thielen began to notice that his youngest daughter, Lexi, was sleeping longer than usual and bruising tenderly, he first attributed it to a heart defect that she has had since birth. But when he took her to the doctor in October 2000, a blood test revealed that she had more than a weak heart. Lexi was diagnosed with leukemia, and she did not come home from the hospital for six months, until April 2001. Her treatment was further complicated when she suffered a stroke, causing her to lose her ability to speak. "She couldn't really communicate where she was hurt," said Thielen. "Somebody had to be there just about around the clock, so there was a lot of time away from home." Thielen said it was important to have a family member with Lexi, since they could understand her even though they didn't know much sign language. Thielen would only come home for a couple days at a time while Lexi's grandma relieved him at the hospital. Then, last February, while Lexi was going into surgery, Thielen met some people in a waiting room who had gone to Disney World with their son through the Make-a-Wish Foundation, and they suggested that he look into it. After attending to the details, Thielen and his daughter made three wishes: a trip to Disney World, Disneyland, or a swing set. 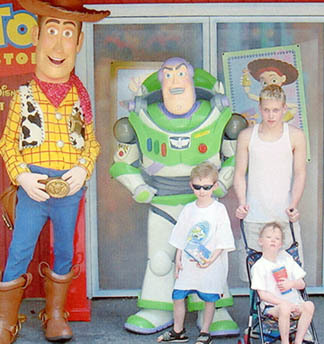 The family was surprised that they were granted their wish for a trip to Disneyworld - for the entire family. "I was surprised that all five of my kids were able to go," said Thielen. "I was able to take extra time to be with the older kids that I normally wouldn't have. The time I got to spend with them was a gift back from the time taken away." Thielen said the trip was good timing, because it followed a bummer of a winter for Lexi's health. But then they got good news: Lexi's leukemia was in remission. They waited until she was done with her maintenance chemotherapy, which helped her immune system recover. After that, the family was ready to go to Disney World in April. "Reality hit when we got the airline tickets and they gave us each $200 spending money," said Thielen. "It'd be different going down there with no money in my pocket. I could have never afforded it on my own, ever." The Thielens began their week-long trip at the end of April with a limo ride to the airport. Once they arrived in Florida, they stayed at a place called "Give Kids the World," which is a hotel 15 miles from Disney World that is specifically suited for ill children, complete with a 24-hour nursing staff and lavish children's entertainment. "When we were down there it was a different kind of stress - a happy, getting-all-the-ducks-in-the-line-and-ready-to-go kind of stress," said Thielen. "At times I thought I was crazy to bring five kids. They all wanted to do something different, but the older kids were a big help when I needed it." The family's main objective was to spend time together without worrying about a strict schedule. They spent time at Disney World, at Universal Studios, and at the Kennedy Space Center. They were given special handicap passes, so they could go to the front of all the lines. They had the most fun at Universal Studios, where they saw the movie set of Twister, and Lexi was able to meet Scooby Doo, Shrek, and Buzz Light Year from Toy Story. Thielen says the best part about the vacation were the intangible things that he will remember as a dad. "You can replace every personal possession you have, but these kids are not a personal possession. I see them more as a gift, and you never know when that's going to be taken away," said Thielen. "I enjoyed seeing them bond a little closer, out of their day-to-day routine. We don't have a chance to do that here because we're too caught up in our daily lives." With his oldest son graduating from high school, Thielen noted that this may have been the last vacation they take as a family. Ironically, Thielen was on the giving end of the Make-a-Wish Foundation many years before his daughter Lexi was even born. One year, he decided to give his Christmas bonus to the foundation. "I never thought I would be a recipient," said Thielen. "It kind of takes things full circle. What goes around comes around." "People can give to the purposes they believe in, but when it goes to a kid that may not have a chance to experience a lot of things us adults do, it's just a wonderful opportunity," he said. "The money is well used; there's no doubt about it." Thielen sees good in sharing Lexi's experience with leukemia with others. Earlier this year he did an interview for a KS95 telethon benefiting the Children's Cancer Research Fund. "For every percentage point that the success rate goes up, that is one less heart broken parent," he said. "It's hard going to the hospital and seeing other parents without their kids. I always think: why isn't it her?" Thielen says it is difficult to have a child that is labeled as "handicapped" or "disabled," when really it is not at all like what the label implies. "It's really more of a blessing," he said. "Right now we're living on borrowed time with her. She wasn't expected to make it out of the hospital." Currently, Lexi, nearly five, is attending pre-school in Paynesville, but she is not done with leukemia yet. Although she is currently in remission, she needs five years of clean bios before she can be declared free of leukemia. Thielen says for children her age, the chance of survival after chemotherapy is 88 percent. If she has to go back for a second treatment of chemotherapy, that number drops to 15 percent. "It's weird how some people can snap through it and some can't. She's so darn stubborn. She does not let very many things put her down," said Thielen.